Tiles are important additions in any bathroom. 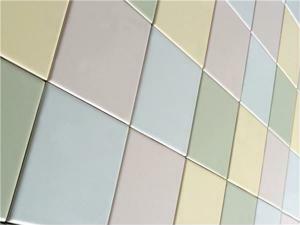 Besides being waterproof, tiles don't decay and are durable enough to last for years. But the questions is: What kind of tiles fit best in your space? There are a plethora of options when it comes to tiles, and the right pieces will depend on your taste and the functionality of the area. For the shower, bigger tiles can provide a sense of space with a touch of elegance. Tiles can also be placed on the wall as opposed to paint, and depending on your need, the pieces can be attached all the way to the ceiling. When it comes to the bathroom vanity, tiles can add an extra touch of sophistication - mosaic tiles are becoming especially popular as backsplashes to not only protect the wall, but also provide visual appeal. Mosaic tiles can also be used as accent pieces in the bathroom. Just keep in mind the color palette of the existing bathroom accessories and choose those mosaic tiles that will match the design of your space.